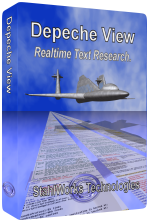 Depeche View Realtime Text Research. Fly over thousands of text files in realtime. One click search, copy, bookmark. Instant text editing by a built-in text editor. Call external programs like compilers, command line FTP, or your favourite text editor through self defined hotkeys or extended mouse buttons. Load, View and Search text from .zip, .tar.gz and .tar.bz2 archive files instantly without prior extraction. Fly through Open Source sample codes in realtime during your search for solutions. Depeche View allows high speed research and edit on a Windows XP/Vista/7 system (32 or 64 bits). Many modern software projects, however, are spread across many platforms, typically editing under Windows, then compiling under Linux. This process is supported by SFK, described further below. SFKTray: The Automation Status On Your Desktop. See the status of your batch jobs, running locally or remote, all in one place in your Windows system tray. Let your shell windows run in background, just look at the lights. This is the missing GUI link of command line automation. Ein buntes Deutsches Comic über arbeiten am Computer, was dabei so danebengeht, und wie man mit ein paar flotten Kommandos scheinbar Unmögliches möglich macht. 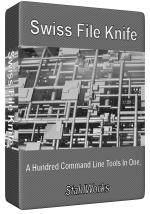 The Swiss File Knife E-Book. All commands in a 300 page PDF, for convenient reading on your tablet or smartphone. Contains a 60 page tutorial with 25 pages of detailed xed examples and a 200 page command reference. The Swiss File Knife Book - on Amazon US, UK, DE. The full monumental documentation, in print, for a long winter night's reading. Includes a 70 page tutorial, 270 page command reference, and 7 page index. The Swiss File Knife Tutorial. The Swiss File Knife. Ultimate Command Line Power. One Hundred Command Line Tools in a Single Executable. Forget about installing, installing, installing. What ever you need for your daily work, it's in there. Find and extract text in binary files, list dir tree sizes, filter and replace text, run an instant ftp server, http server for easy file transfer, find duplicate files, join many text files into one, create and verify md5 checksum lists, run a command on all files, detab text, create hexdumps from files, trace contents of a tcp connection, find dependencies between files, print colored text to terminal, locate commands in the path, print last lines of a file, convert CR/LF, hex to binary, binary to source code, split and join large files, and much more. SFK Base is Freeware and Open Source. SFK Extended Edition allows direct reading of .zip, .tar.bz and .tar.bz2 file contents and comes with a powerful replace command.